17.3-inch netbook. Packard Bell equips the EasyNote with a energy-saving APU that was originally intended for use in mobile and thin subnotebooks/ultrabooks. Theoretically, the customer should receive a 17.3-inch office notebook that works as quiet as a whisper and needs very little energy. But is that really the case? Read our review to find out. The assortment of inexpensive 17.3-inch notebooks available on the market is not nearly as expansive as the array of cheap 15.6-inch notebooks for sale today. Nevertheless, potential buyers have a variety of options before them. 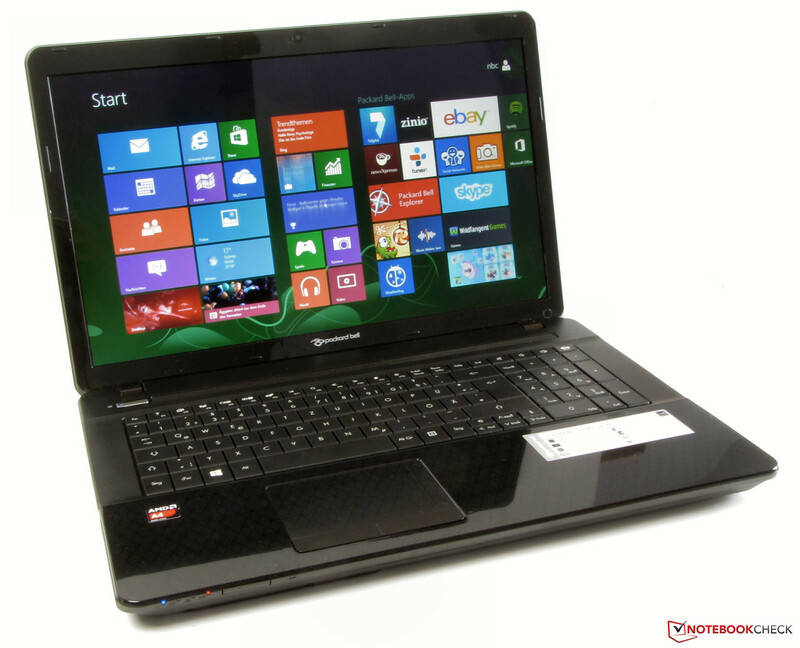 Packard Bell expands the list with new models in their EasyNote LE69KB line. The manufacturer chose to install AMD APUs in these devices -- APUs that are primarily intended for use in subnotebooks, ultrabooks and netbooks. Read our review to discover whether the combination of a 17.3-inch notebook and a ULV APU makes for a commendable product or not. To assess the notebook compared to its competition, we will look at how it does compared to the Lenovo G700 (Pentium 2020M, HD Graphics (Ivy Bridge)) and the Asus F75VC-TY088H (Core i3-2370M, GeForce GT 720M). The version of the Asus F75VC we tested is no longer available -- now the TY0222D model is on the market. The latter is equipped with a Core i3-3217U processor. The rest of the components are identical. Without a Windows operating system, the Asus notebook is currently priced at 410 Euros (~$565). The EasyNote is not unfamiliar to us. We have already reviewed two notebooks with identical construction -- the Packard Bell EasyNote LE69KB-45004G50Mnsk (AMD A4-5000, Radeon HD 8330) and the Acer Aspire E1-772G (Core i5-4200M, GeForce 820M). For that reason, we will not cover the case, connectivity options, input devices or speakers in this review. 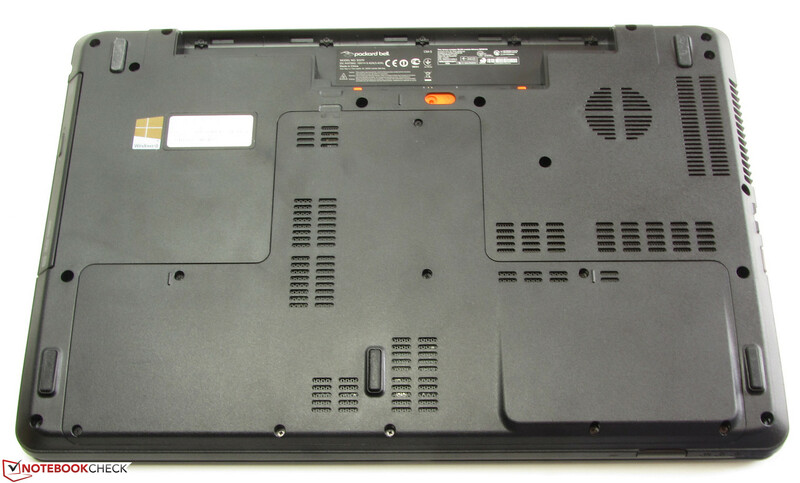 The Packard Bell EasyNote LE69KB-23804G50Mnsk. The back side of the case is glossy. 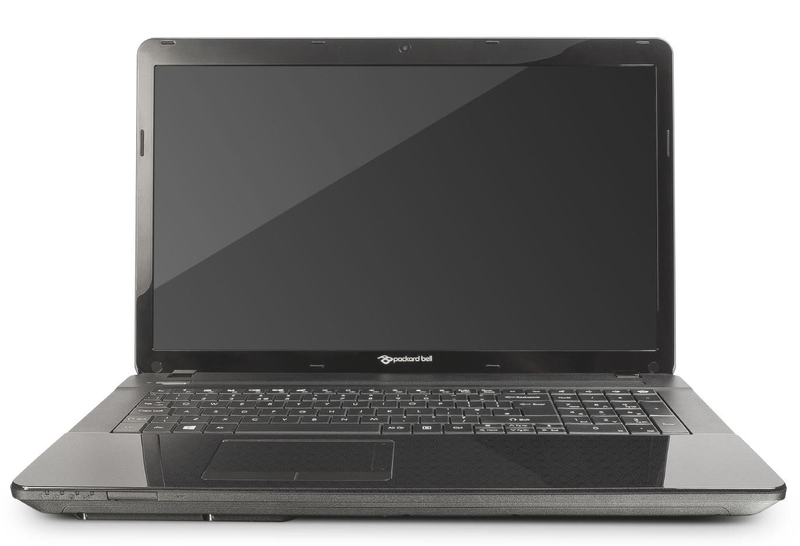 Packard Bell equips their EasyNote with a glossy 17.3-inch display with a native resolution of 1600x900 pixels. Compared to the competition, the screen's average brightness of 228.4 cd/m² is in the mid-range. The contrast (709:1) and black value (0.34 cd/m²), however, are good. All in all, considering the price of the notebook, these numbers are completely acceptable. When it comes to brightness, the F75VC and G700 lag only a little behind the EasyNote, but they cannot keep up with our review device's contrast and black values. At an average DeltaE 2000 deviation (ColorChecker and grayscale) of about 8 out of the factory, the display does better than the majority of screens we have tested. However, no color enters the target range (DeltaE of less than 3). The display proves to have a blue cast, but that could be rectified with calibration -- we tried it. The EasyNote is not necessarily suited for outdoor use. The display's reflective surface makes it very difficult to see the screen content. In the shadows, however, it is possible to use the notebook. The display's viewing angle stability corresponds to what is generally to be expected of a notebook in this price range: If you change the vertical viewing angle, the image quickly distorts. Along the horizontal, the screen content remains viewable across a wider range of angles. It would be possible for several people to look at the screen at once. Packard Bell's EasyNote is an inexpensive office notebook in the 17.3-inch format. The computer can handle tasks that require little in the way of performance. That includes surfing, Skyping, writing, and watching videos, for example. The EasyNote is currently available for about 400 Euros (~$550). Packard Bell is also offering a version with a 1 TB hard drive and 8 GB of working memory, priced at about 450 Euros (~$620). The model we reviewed in 2013 -- the Packard Bell EasyNote LE69KB-45004G50Mnsk (AMD A4-5000, Radeon HD 8330) -- is also still available for 400 Euros (~$550). The EasyNote runs on an E2-3800 APU from AMD's current Kabini generation. The CPU portion of the APU consists of a quad-core processor with a speed of 1.3 GHz. There is no turbo. The APU does not require much energy; the TDP is 15 Watts. The processor completes the CPU tests in the various Cinebench benchmarks at full speed -- anything else would have been a surprise. The quad-core processor's results lag behind those of the two competitors' Intel processors. Overall, the system runs better than we expected with the APU installed in the device. As long as the APU is not overtaxed, the user can work easily on the system. The results in the PCMark 7 benchmark prove to be just what we generally anticipate when testing notebooks with AMD APUs: Not particularly good. 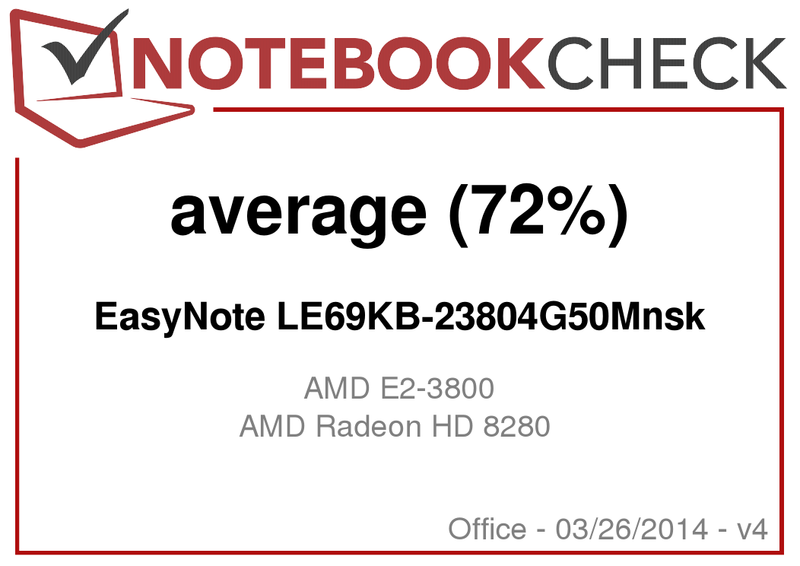 The EasyNote cannot hold a candle to the G700 and F75VC's results. Packard Bell outfits the EasyNote with a hard drive from Western Digital. The drive has a capacity of 500 GB and runs at 5400 rpm. The transfer rates we calculated with the help of CrystalDiskMark are good for a 5400 rpm hard drive. The EasyNote possesses a Radeon HD 8280 graphics core that runs at a speed of 450 MHz and supports DirectX 11.1. The GPU proves to have better performance capabilities than the G700's HD Graphics (Ivy Bridge) chip. Neither competitor can dream of keeping up with the Asus computer's GeForce GT 720M graphics core. The Radeon GPU's performance is more or less on par with Intel's HD Graphics 4000 graphics cores. If you are looking for a notebook capable of playing games, the EasyNote is not the computer for you. The device can only run a few games at low resolution and low quality settings. Of course, the Asus F75VC is an alternative here. It can run most current games fluidly. The Acer Aspire E1-772G (Core i5-4200M, GeForce 820M) is another option. It is structurally identical to the EasyNote, and the 54204G50Mnsk version is available for just 499 Euros (~$685) -- without the Windows operating system. We expect a 17.3-inch notebook with an APU that consumes little energy to run relatively quietly. The EasyNote does not disappoint us in this regard. In idle mode, the fan often stands still and only the whirring of the hard drive is audible. Under full load (stress test) as well, the fan does not whiz loudly -- in fact it works almost inaudibly. Things look similar on the Lenovo G700. The Asus computer produces considerably more noise than its two competitors. That is unsurprising, as the F75VC is equipped with a dedicated graphics card. The EasyNote in the stress test. The EasyNote's case never grows especially warm. The temperatures remain in the green in every spot we measured. The G700 and the F75VC both warm up somewhat more than the Packard Bell computer under full load. 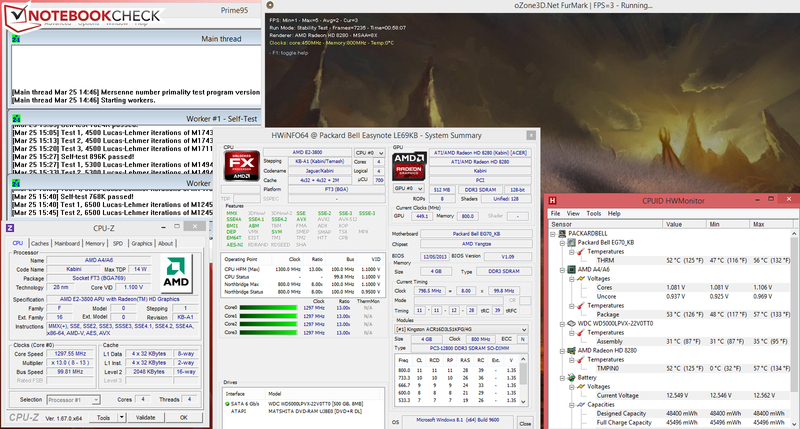 The EasyNote's CPU completes the stress test (Prime95 and Furmark running simultaneously for at least an hour) at full speed (1.3 GHz) both in AC power and battery mode. The GPU runs the stress test at 450 MHz in AC power mode. In battery mode, the GPU throttles to 400 MHz. The CPU temperature levels off at about 53 °C (127.4 °F) in the stress test. (+) The maximum temperature on the upper side is 29 °C / 84 F, compared to the average of 33.9 °C / 93 F, ranging from 21.2 to 62.5 °C for the class Office. 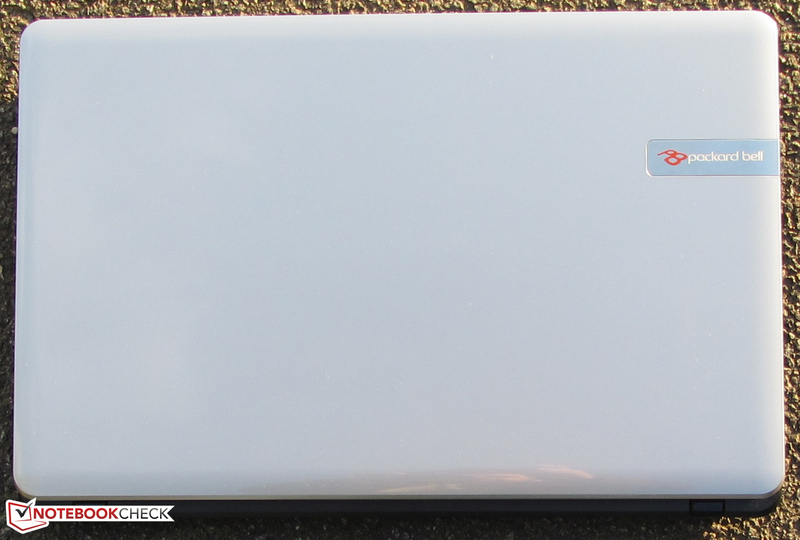 The EasyNote's APU has a TDP of 15 Watts. The competitors' Intel CPUs both have TDPs of 35 Watts. As a result, it is unsurprising that the Packard Bell computer uses less energy overall. In idle mode, all three devices consume similar amounts of energy, but at a power draw of 22.9 Watts in the stress test, the EasyNote is clearly more frugal than the competition. The F75VC, of course, uses the most energy, as it is outfitted with a dedicated GPU. In the WLAN test, which is intended to simulate practical, everyday use, websites are loaded automatically at 40-second intervals. The energy-saving profile is active and the display brightness is set to about 150 cd/m². In this test, the EasyNote reaches a battery runtime of 5:01 h and comes in just behind the G700 (5:16 h). The F75VC (3:49 h) runs out of steam considerably earlier. The Packard Bell EasyNote LE69KB-23804G50Mnsk has enough performance capability to complete simple tasks like surfing, Skyping or writing. The computer always runs quietly and is conservative with its use of energy. Additionally, the EasyNote offers a good battery runtime in our practical WLAN test. The display is not too bad either. Its contrast is good, and so is its brightness level. We often run into worse models in this low-end price range. Not only is the Lenovo G700 equipped with a stronger processor -- it is also cheaper. The computer is available starting at just 299 Euros (~$410). The structurally identical G710 successor series is another alternative to consider. This line is outfitted with Haswell processors. The cheapest model at present, the Lenovo G710 59399734, comes with a Core i3-4000M processor and costs about 440 Euros (~$605) without a Windows operating system. The Asus F75VC is a good option if you are looking for a computer capable of running games at the lowest possible price. The F75VC-TY0222D (Core i3-3217U, GeForce GT 720M) version costs about 410 Euros (~$565). It does not come with a Windows operating system. 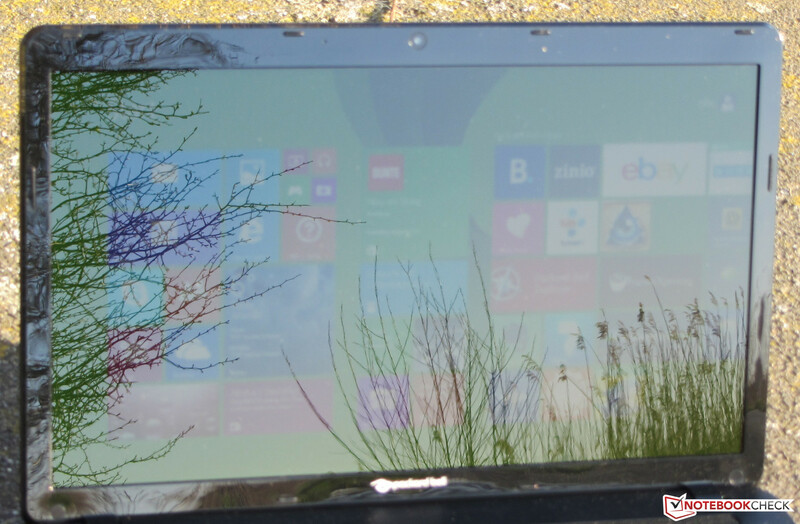 In Review: The Packard Bell EasyNote LE69KB-23804G50Mnsk, courtesy of Acer Deutschland. That the computer runs quietly and uses little energy. We also like the two-year warranty. A stronger APU and a matte display. For its price, the notebook is equipped with a decent display. Asus F75VC-TY088H, Lenovo G700, Lenovo G710, Packard Bell EasyNote LE69KB-45004G50Mnsk, Toshiba Satellite C70D-A-10L, Acer Aspire E1-772G, HP Pavilion 17-e126sg, Asus F75A.